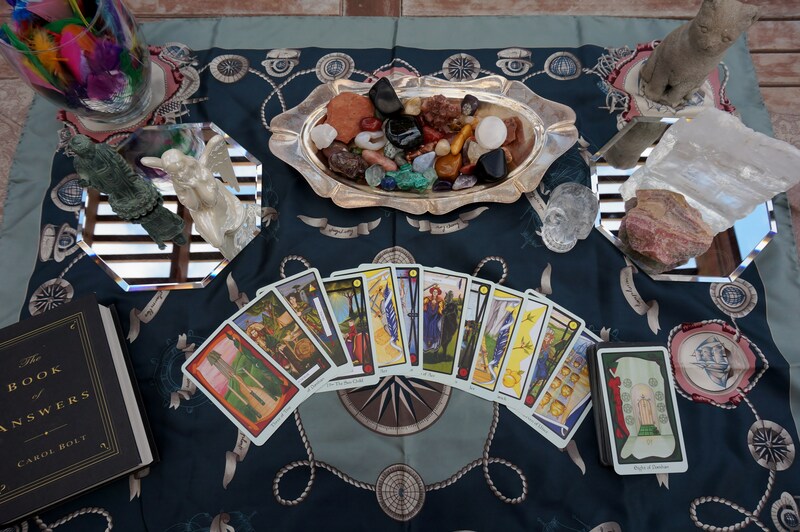 Tarot Tips and Tricks – Class on February 25 from 7-9pm in Hutto, TX! Reading the Tarot in my backyard in Central Austin! You deserve to have fun and feel confident when you read the tarot for yourself, your family, and your friends. Tips and Tricks of the Tarot will inspire you to brush off your cards and come to a new level of enjoyment and confidence when you read. Once you learn a few key ideas, you can stop worrying about “the rules” and connect to your intuition for more information during your readings. This fun evening of learning, discussion, and hands-on practice will provide you with simple tools to keep building your skills, every day! We will discover if “superstitions” about tarot decks are worth following, how to use storytelling as a memory aid, tapping into numbers to help you quickly find meaning in a spread, and more. Bring your favorite Tarot deck, paper, a pen, and a smile! Cost: $11.00 at the door – to be paid to WYZDOM of the Ages Meetup. Please RSVP at the WYZDOM of the Ages – Austin Area and Beyond Meetup page for this event! If you don’t have a meetup account, it’s free! You can also email me at ChristinethePsychic@gmail.com so I can email you the address and directions. We’re going to have a great night! The event will be listed on the WYZDOM of the Ages – Austin Area & Beyond – so head on over to join the group! There will be lots of talks in central Texas on Wednesday nights! This entry was posted in Classes, Events, Tarot/Oracle and tagged Austin, Christine Linial, Hutto, tarot, tarot class, WYZDOM Wednesday on February 19, 2015 by christinethepsychic.